Over the past couple of days, the port of Hamburg has celebrated in the air as well as on the water. The A320neo, the newest and most quiet member of the Lufthansa fleet, jetted through bright blue sky, crossing Hamburg’s port not once but twice, circling over the Elbe river and congratulating the port with a few wags of its wings. The Airbus was not an unannounced party-crasher – it was a welcome guest, earning a quite a number of ‘oohs’ and ‘ahs’ before being captured on quite a number of smartphones. 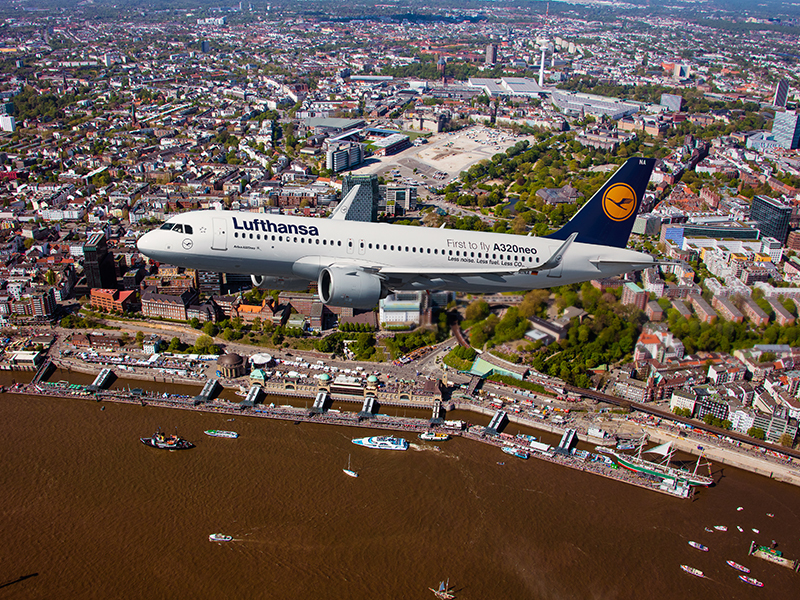 The A320neo has a very special relationship with Hamburg. The aircraft was built in Finkenwerder, and in January this year it was the first aircraft of this type to be delivered to Lufthansa. The Lufthansa fleet now includes two A320neos, and they regularly fly between their home base in Frankfurt am Main and Hamburg-Fuhlsbüttel. What's more, on Saturday, 4 June, the A320neo and the Fanhansa winner's plane, a Boeing 747-8, can be marvelled at this year's International Air Show 2016 (ILA) in Berlin. The A320neo will be part of the flight programme, while the B747-8 is actually open to visitors. In 2015, the jumbo flew the football world champions from Rio de Janeiro to Berlin and since then the fuselage has been decorated with the word “Siegerflieger” (winners’ plane) in big letters. The A320neo features technologically innovative engines and improved aerodynamics, which significantly reduces noise and CO2 emissions. The A320neo is around 20 percent more fuel-efficient per passenger than current comparable models. The 85-decibel noise footprint of an A320neo taking off is only half that of its predecessor model, the A320. The aircraft thus actively contributes to noise protection. The Lufthansa Group has ordered a total of 116 neo aircraft. This year, three more A320neo shall be handed over to Lufthansa.